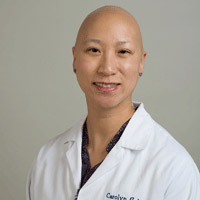 Dr. Goh practices general medical dermatology with a specialty in hair loss and scalp disorders. She did undergraduate studies at Stanford University with a major in Comparative Studies in Race and Ethnicity with a minor in Human Biology. She completed medical school at Weill Medical College of Cornell University with honors in both research and community service. She did an internship in internal medicine at Harbor-UCLA Medical Center and completed her residency at New York-Presbyterian Hospital/Cornell in New York City. Her research and clinical interests are in all types of hair loss including alopecia areata and scarring alopecia. She has been active with patient advocacy groups and local support groups for patients with hair loss. Additionally, she sees children and adults for all skin disorders including eczema, psoriasis, acne, and skin cancer. Baldness, or hair loss, can be caused by many things including aging, hormones or illness. It's more common in men and can be treated with hair transplants or other procedures. The skin is the largest organ of the body. It helps define how you look. Learn detailed information on common dermatological procedures, including acne scar removal, chemical peels, dermabrasion, dermaplaning, and laser skin surgery. Many forms of hair problems require clinical care by a physician or other health care professional. Detailed information on hair problems, including baldness (alopecia), excessive hairiness (hirsutism), and ingrown hairs. Detailed information on the most common types of skin pigment disorders, including albinism, melasma, vitiligo, and skin pigment loss following sun damage. Hair loss disorders including alopecia areata, androgenetic alopecia, and scarring alopecias. Goh C, Biswas A, Goldberg LJ. Alopecia with perineural lymphocytes: a clue to linear scleroderma en coup de sabre. J Cutan Pathol. 2012 May;39(5):518-20. Goh C, Zippin JH. Androgenetic alopecia: diagnosis and treatment with a focus on recent genetic implications. J Drugs Dermatol. 2009 Feb;8(2):185-92. Goh C, Lane AT, Bruckner AL. Support groups for children and their families in pediatric dermatology. Pediatr Dermatol. 2007 May-Jun;24(3):302-5. Goh C, Finkel M, Christos PJ, Sinha AA. Profile of 513 patients with alopecia areata: associations of disease subtypes with atopy, autoimmune disease and positive family history. J Eur Acad Dermatol Venereol. 2006 Oct;20(9):1055-60.